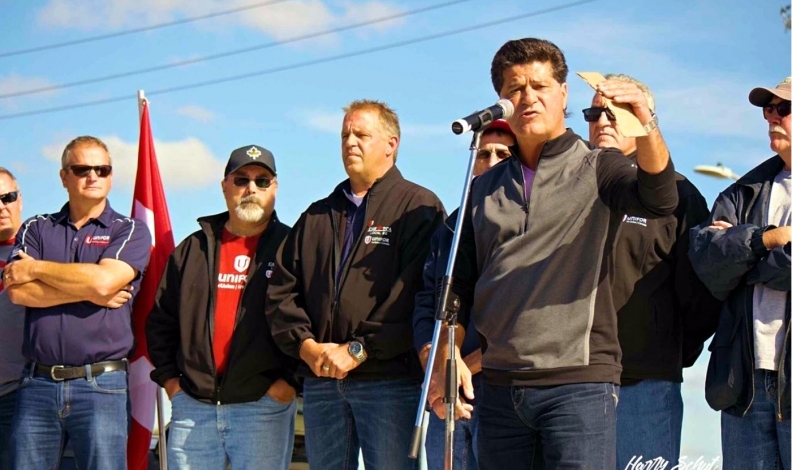 Unifor President Jerry Dias speaks to striking Local 88 workers at the General Motors CAMI plant in Ingersoll, Ont. INGERSOLL, Ont. -- Ontario Economic Development Minister Brad Duguid said Friday that he had spoken with officials from General Motors Canada and Unifor during the last 48 hours as a strike at the automaker's CAMI plant in Ingersoll, Ont., drags on. But, his discussions didn’t end the job action. Unifor, which represents about 2,500 striking workers who assembly the popular Chevrolet Equinox at the plant, says the two sides remain far apart on job security and economic issues. The members of Unifor Local 88 walked off the job Sept. 17 as negotiators worked to have GM designate the plant as the lead producer of the Equinox SUV, which is also produced at two plants in Mexico. Duguid spoke with GM Canada President Stephen Carlisle and Unifor President Jerry Dias. Neither asked for government support to keep the Equinox lines in Ontario, Duguid said, while urging both parties to reach an agreement. The strike has led to the automaker scaling back transmission production at its St. Catharines plant. Magna International has also stopped deliveries to the plant. Unifor says several other suppliers in southwestern and central Ontario are also affected by the job action at CAMI. The crossover is GM's second best-selling light vehicle and among the top 10 selling vehicles in the United States. September sales in the United States were up 80 per cent and up 27 per cent in Canada during the same month. The union says it has been meeting with the automaker daily since Sept. 27 and have “worked through a lot of the contract language” but is awaiting a response from GM on the outstanding issues. Unifor says the two sides have agreed to pause the talks over the Thanksgiving holiday weekend and reconvene Oct. 10, but the union said it is ready to resume bargaining “at a moment's notice” should GM respond sooner. GM Canada did not immediately respond to a request for comment on the ongoing negotiations. On Oct. 1, Dias dismissed GM's latest contract offer as “fluff,” saying it still allows the company to shift its resources away from the Ingersoll plant. He said the union will not back any deals unless they're confident that more jobs won't be shifted to Mexican plants. Dias said pre-strike production at Ingersoll was 400,000 vehicles but had since dropped to 190,000 vehicles.